adapted from my article in The Literary Encyclopedia, first published September 2014. Some books are disparagingly described as “escapist”, so easy to read that they will provide an escape from present troubles or boring routine. There is an implication that “good” books must demand a more committed response from readers than merely letting themselves be distracted. Can an escapist piece of writing also be good writing? The thrillers and gothic romances of Peter O’Donnell (1920 - 2010) provide interesting matter for such a discussion. Peter O’Donnell was born in London on 11 April 1920, and went into journalism as a teenager. He joined the Royal Corps of Signals when war broke out and served as a radio operator with the 8th Army in the Middle East. A desert encounter with a refugee girl in Persia in 1942, related in several articles and interviews, later supplied him with a starting point in the narrative of his most famous protagonist, Modesty Blaise, the quintessential survivor. Back home, he worked freelance writing fiction for women’s magazines and as a scriptwriter for several strip cartoon series in different newspapers, including Tug Transom, Garth and Romeo Brown, developing his collaboration with the illustrator Jim Holdaway. 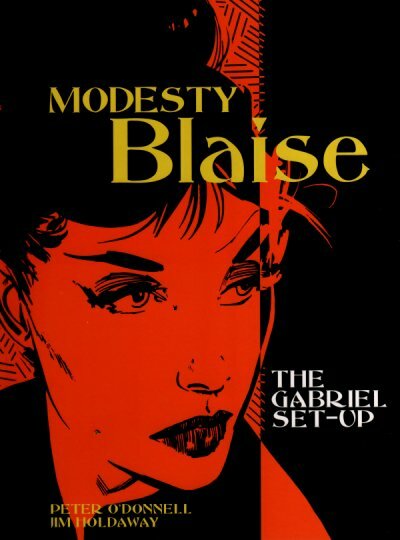 In 1962, given a brief to create a new strip cartoon and aware of a rising feminist movement, he decided to create a woman hero, Modesty Blaise. Abandoned as an infant in a displaced persons camp in Greece and unaware of her real name, her parentage or origins, the 12-year-old Modesty teams up with a refugee professor; she forages food for him and he gives her an education. When she reaches sixteen he dies and she joins a Tangier criminal gang, taking it over when the leader is killed and turning it into a successful but rather moral organisation, as much devoted to destroying rival less scrupulous gangs of drug dealers and vice rings as it is to conducting its own jewel robberies and industrial espionage. Retiring in her twenties, fabulously wealthy, she settles in London but grows bored and is quite relieved when invited by a British secret service chief to undertake a task for him. Her erstwhile henchman Willie Garvin supports her in this, which turns out to be the first of many. The owner of the Daily Express vetoed the strip, as he did not want a hero with a criminal past. Luckily the editor of the Evening Standard was glad to take it on, and the strip ran from May 1963 until February 2001, earning world-wide syndication. It was especially popular in Scandinavia. Within two years the film rights were sold and O’Donnell provided a script. The film was to be directed by Joseph Losey, recently banished from the USA by the House Un-American Activities Committee. The script was rewritten by other hands five times and by the time the film appeared in 1966 it had been turned into something unrecognisable and distasteful to O’Donnell, who recast his original script as a novel. This was the first of eleven, together with two collections of short stories. The strips eventually comprised ninety-five stories, each spread over four to six months, each day’s episode consisting of two strips containing three, or sometimes two or four frames. O’Donnell supplied only the stories and dialogue, working first with Jim Holdaway and, following his death in 1970, with a succession of artists, settling in the end on Enrique Badia Romero, a Spanish artist who initially spoke very little English. The strips and the prose fiction were largely held apart; no incidents occurring in the strips were mentioned in the novels and vice versa, and very few characters apart from the central ones, Modesty, Willie, the American millionaire John Dall, and British intelligence chief Sir Gerald Tarrant, feature in both. It is a vital element of both that Modesty and Willie, in spite of being completely in harmony, do not have a sexual relationship, although both have plenty of other sexual partners. Modesty is Willie’s “princess”; she is the leader and initiator, and sleeping with her would be “a liberty”. O’Donnell was upset when people who wanted to adapt the stories for film or TV would not accept this and expected a more conventional hero/heroine relationship. The plots of the strip stories are understandably rather simpler than those of the books. Large numbers of people bought the newspapers in which the strips were syndicated. There is no means of knowing how many read them carefully or paid attention to the story development, but we can be confident that any kind of plotting that demanded detailed memory of characters or previous incidents would not work. Each story, therefore, tends to have a single setting or progress from a London setting to an exotic one, and a limited cast of characters, clearly identified as benign or evil. That does not prevent the stories from being ingenious and imaginative, though the outcomes are often sentimentalised to a degree that would not work in a book, with happy endings too neatly happy. As for the settings, it is worth remembering that the sixties was the era of the £50 foreign currency allowance, when most Evening Standard readers were just beginning to replace Butlins with package tours to Marbella, and had no experience of foreign countries other than those of the men (mostly men) who had served in North Africa, Italy and Normandy. The Caribbean and the Far East were places of the imagination where secret agents foiled their enemies and sipped Martinis. 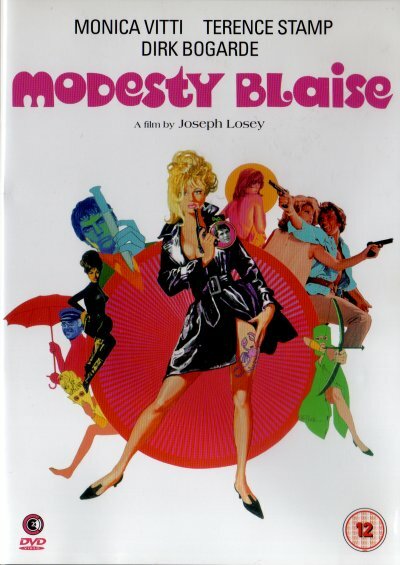 The first book, called simply Modesty Blaise, has a relatively conventional criminal enterprise at its centre, the theft of a large quantity of diamonds from a vessel at sea. Modesty and Willie find the only way to frustrate the plan is to pretend to be on the same pursuit themselves, thus getting close to the mastermind Gabriel. A set-piece fight with the villainous and muscular Mrs. Fothergill is the first of many such encounters pitting Modesty against a skilled assassin employed by the chief villain, including in later books psychopathic Siamese twins, a fencing master, a martial arts expert, a fast-draw gunslinger, and a gorilla. O’Donnell claimed that the only sentence that survived from his first draft of the film script into the finished film was “I wonder what happened to Mr. Fothergill.” He played on this line more than a dozen years later by writing a successful West End play called Mr. Fothergill’s Murder, which had no connection with Modesty Blaise. The Mr. Fothergill in the play is a blow-up puppet. The novels’ settings and plots become progressively more exotic and far-fetched. In Sabre-Tooth Modesty and Willie have to prevent a mercenary army’s takeover of Kuwait. In I Lucifer the setting ranges from Paris via Yugoslavia and the Frisian Islands to the Philippines. In that book we have the first suggestion of something supernatural, a deranged young man with an ability to predict accidental deaths, together with dolphins trained to deliver ransoms untraceably. The second supernatural strand enters with the next book, A Taste for Death, which introduces Dinah Pilgrim who has extraordinary dowsing abilities with which she can locate not only water, but mineral deposits and buried treasure. Rescued by Willie from an attempted abduction in Guatemala, she is kidnapped again to help villains locate Roman treasure in the Sahara. The Impossible Virgin begins in East Africa, diverts to London and France, and then returns for a climax in East Africa, where Modesty is rescued from a gorilla’s cage by the fact that her companion, Dr. Pennyfeather, has read books about gorilla communication. The Silver Mistress is set mainly in France and involves a good deal of pot-holing. Here the chief villain is engaged in blackmail on an industrial scale, to which end he kidnaps Modesty’s friend Sir Gerald Tarrant in order to extract secrets of security vetting interviews. Last Day in Limbo, one of the best of the series, starts with a failed attempt to abduct Modesty and her millionaire boyfriend John Dall, and ends on a plantation set up deep in South American forests to provide a former plantation slave with a way of avenging herself by enslaving a host of plutocrats and film stars. Dragon’s Claw has an Australian newspaper tycoon who steals works of art and kidnaps artists and art critics to spite aesthetes who have sneered at him, with the action covering London, Amsterdam, Greece and the tycoon’s private island in the Tasman Sea. The Xanadu Talisman begins with an earthquake in which Modesty is buried under a collapsed hotel. A later episode in the south of France embodies “escapism” in its most literal sense. A crime boss, convinced that Modesty has killed one of his associates, has Willie chained to a cement block and dropped to the bottom of a flooded quarry. Somehow Modesty has to get air to him and unbolt the shackle that holds him down. She manages, of course, in a very well-written account that has one suspending disbelief. The rest of the action is set mainly in North Africa, and surrounds the theft of the crown jewels of the Shah of Iran at around the time of his deposition. The Night of Morningstar gives us a terrorist organisation to rival James Bond’s SPECTRE, but Modesty’s quarrel with it is not from any sense of patriotic duty, merely that one of her own friends has been damaged. Modesty is often described in publicity materials and reviews as a “female James Bond”, but this is completely inappropriate. In her own words, she “doesn’t go looking for trouble”, and will usually intervene only if she or her friends are threatened. The last of the novels, Dead Man’s Handle, was badly received by the critics and is by common consent one of the weakest. It has Willie being kidnapped and brainwashed to persuade him that Modesty is his enemy and he must kill her. That part of the action is vivid, but the main plot concerning a shipping hi-jack is rather unconvincing. 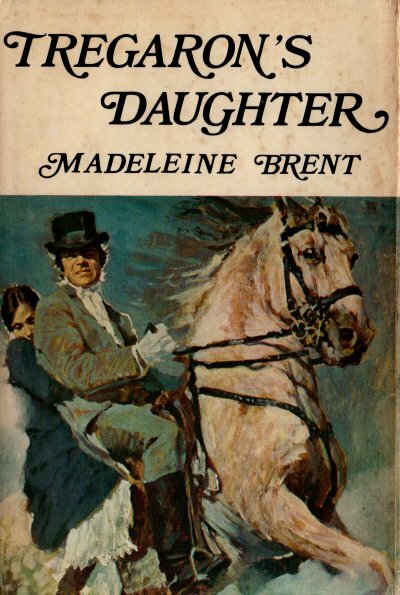 In 1971 O’Donnell’s publisher invited him to write a “gothic” romance appealing to a women’s market. He wrote Tregaron’s Daughter, in which a Cornish fisherman’s daughter rescues a visiting aristocrat from drowning, is befriended by his family after her father dies, and then discovers she is distantly related to an Italian count who wishes to adopt her. It takes several plot twists before she discovers who is to be trusted. This was the first of nine books, each set around the year 1900 and featuring a self-reliant heroine in her late teens or early twenties. Often the search for the heroine’s identity is a main theme, sometimes with an HMS Pinafore style switched babies plot. In many cases the heroine comes to Britain after being brought up in a remote foreign country, China, Nepal, the Caribbean, or Australia, and much humour arises when she is confronted by and misunderstands Victorian etiquette. 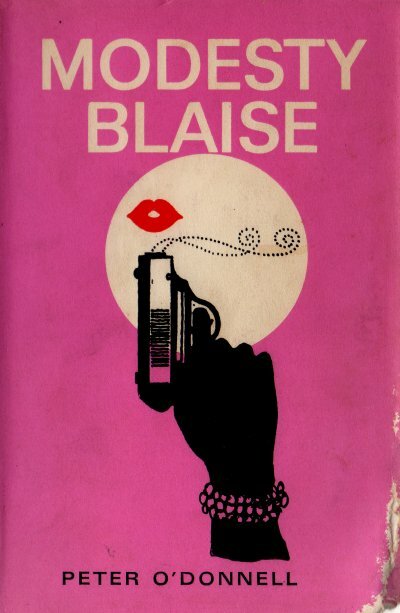 O’Donnell wrote these books under the name Madeleine Brent (picking up the initials of Modesty Blaise), and concealed his authorship for a number of years, even to the extent of getting his wife to sign correspondence. Inevitably the books contain some stereotyping, both of gender and of race, though less than was present in a great deal of the fiction of the time. The written style is efficiently unobtrusive, and largely free of cliché. What is remarkable is how O’Donnell manages to pace his plots. The stories consist of sets of episodes, self-contained but coherently linked, each of which is memorable in the way a good short story is memorable. One gets the sense that O’Donnell is writing for the kind of reader who does not sit down to read a book at a sitting but one who reads for a few minutes before going to sleep or on a commuter train. It is something he may have learned from scripting the strips, and it is a valuable talent in a novelist.